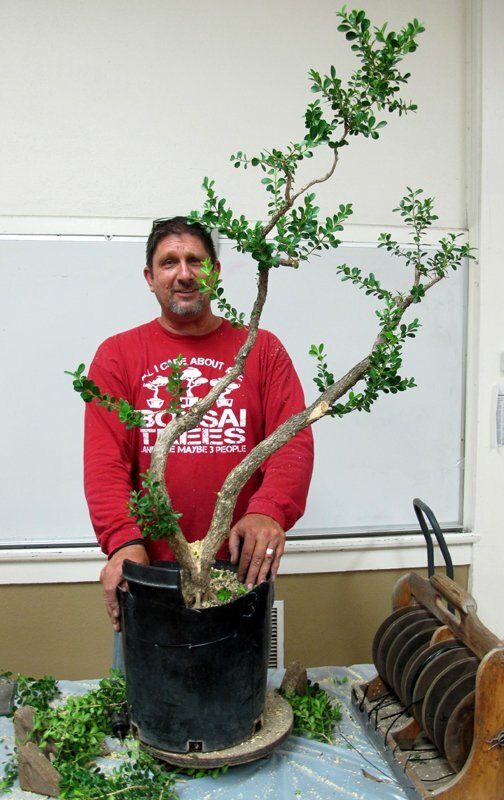 In July 2016, Bob Pressler brought in a 15-year-old boxwood, one of 125 that he had collected in 2015, or rather that he had his staff at his nursery dig up for him. It’s great to be the boss. 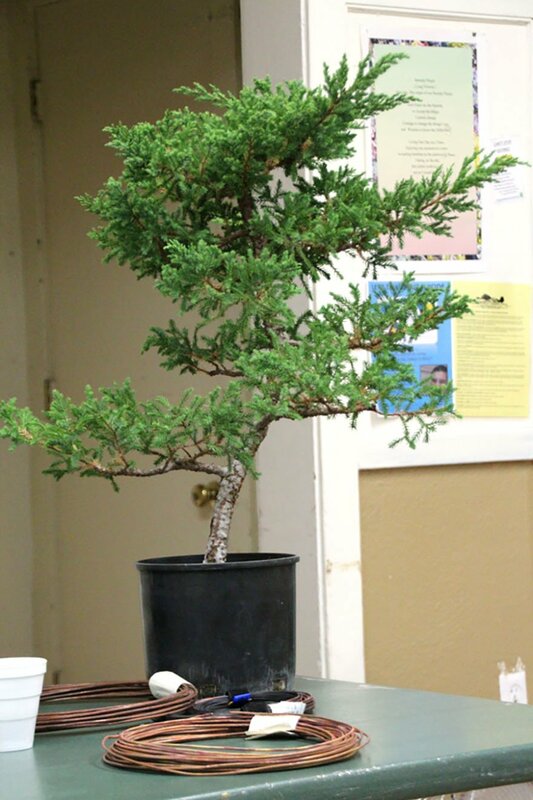 He did an initial pruning on the tall bushy boxwood that he brought for the demo, turning it into a bunjin style bonsai-in-progress, also adding interesting features to the trunk. He returns on Tuesday, October 10, for stage two – refinement and repotting. He thinks it will take three sessions to make the tree show-worthy. 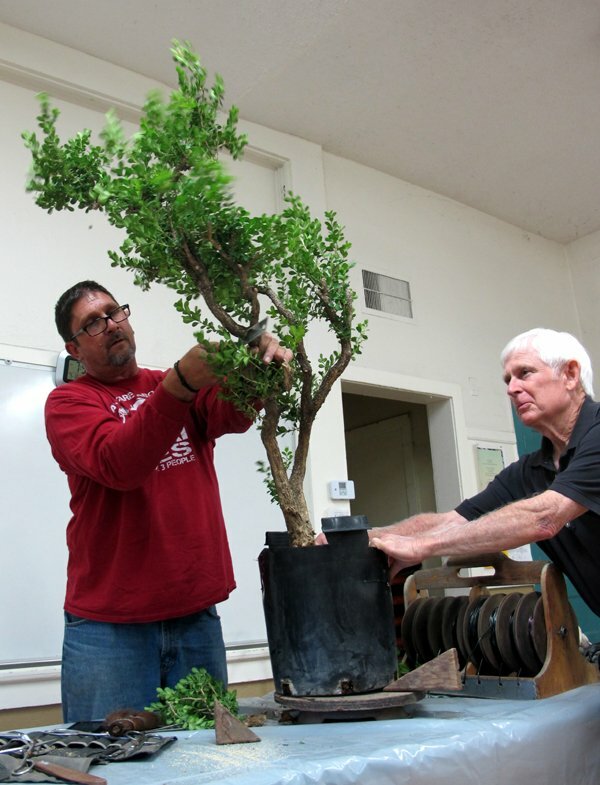 Bob is the owner of Kimura Nursery, 17230 Roscoe Blvd in Northridge www.kimurabonsainursery.com He is a member of the California Bonsai Society and John Naka’s club Nampu Kai. 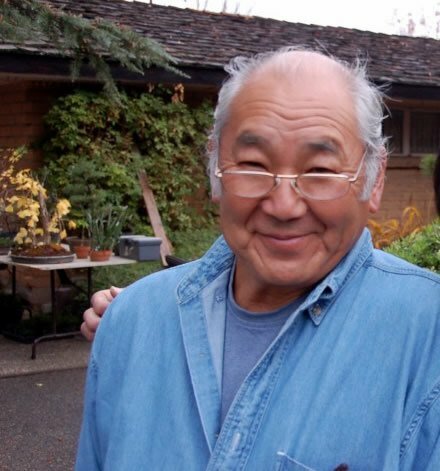 He has studied with a variety of teachers, starting informally with Frank Okamura at the Brooklyn Botanical gardens in the early ‘70s when he was a boy. He is always entertaining and has a keen eye for what makes an interesting boxwood, which is handy, seeing as how he has 124 more boxwoods to go. The bad news this month is that we are frantically looking for a new venue for next year’s show and plant sale. The Botanic Garden has told us that if we want to have our show there in May as we have for the past 13 years, it will cost $11,000! No kidding, $11,000.00, and that includes a 30% discount for non-profit organizations! They have offered to host our show on our previous very generous terms on a weekend in August which is not a good month for our trees, especially deciduous ones, but if we don’t come up with a better site very soon, we just might have to accept their offer and deal with all the disadvantages. We are evaluating several already, but let me know if you know of a suitable affordable site. Stay tuned. 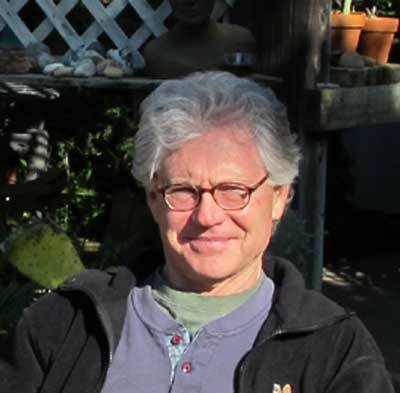 The good news is that we have Bob Pressler back this month to continue his Raw-Material-To-Show-Tree-In-Three-Years project, and we will once again have a mini-show at the Asian-American Festival at the Presidio on Sunday, October 8. Plan to come any time between 11 AM and 3 PM. 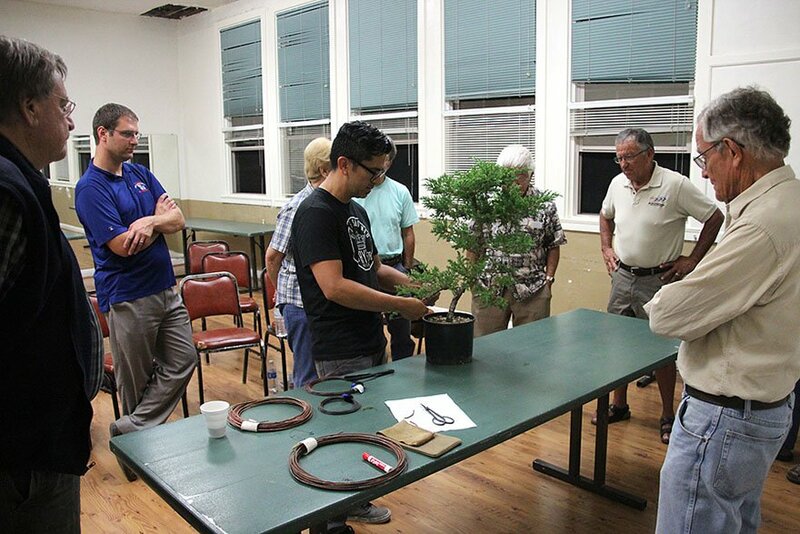 Club member, Daniel Martinez, worked with Ryan Neil in 2014 in Oregon and he reported on his adventures at our September 2015 meeting. 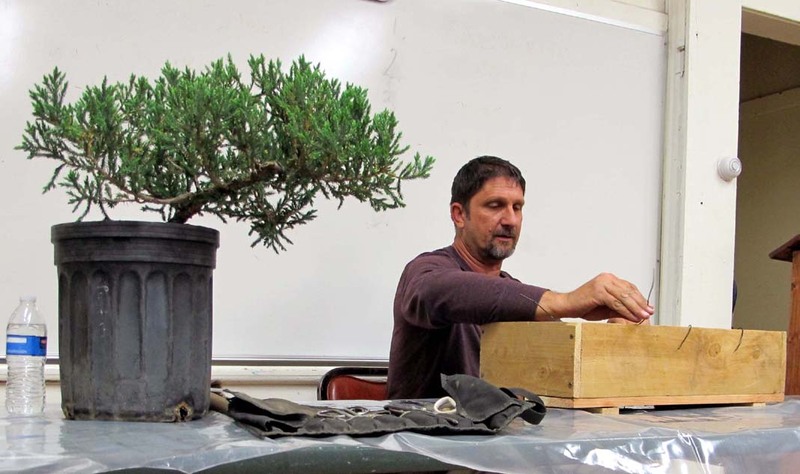 Ryan is considered one of the hottest young bonsai artists in America today. 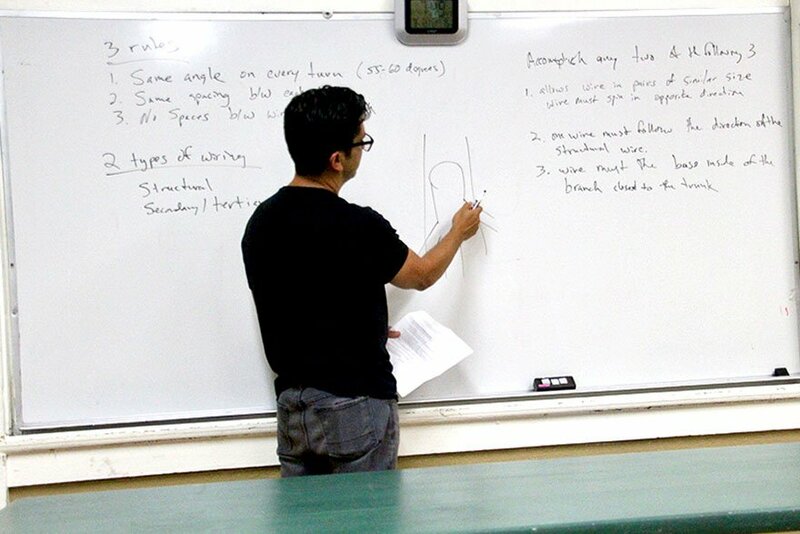 At the September 12th, 2017 meeting, Daniel shared some of Ryan’s wiring philosophies and techniques. Daniel said there are two types of wiring — structural and secondary/tertiary. 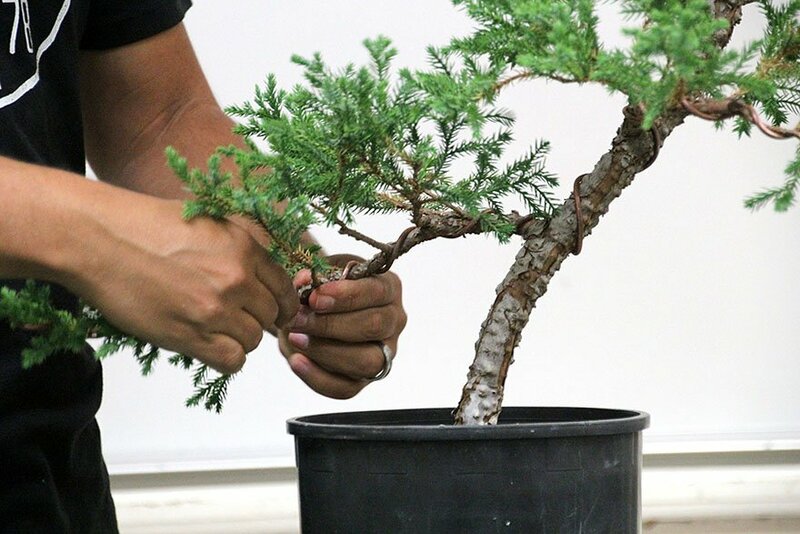 I use a third method often referred to as “what the heck is that?” Structural refers to the shaping of the main part of the tree and secondary/tertiary the smaller branches. According to Daniel, Ryan has three rules when wiring: use the same angle on every turn (55-60 degrees); use the same spacing between each turn; and leave no spaces between wire and branch. Ryan even allows wire to dig into branches sometimes, a technique I have used, though not on purpose. Using a wire gauge large enough to accomplish your bend is important and if it is too large for the smaller part of a branch, stop short and use a thinner wire for the end. Wires must spin in opposite directions on the two branches of similar size that you have paired to wire. The wire must enter at the shoulder of the branch closest to the trunk of the tree. Ryan is okay with crossovers if the wire is providing functionality. This is another technique I excel at — crossovers, not functionality. Daniel says that Ryan’s design preference is in off-center apexes. Here are some photos of Daniel in action. Just Two Remaining Fall Workshops – $30 Each! – Sign Up Now! Kunimoto at last year’s event. The Santa Barbara Trust for Historic Preservation presents the Asian American Neighborhood Festival, an outdoor event celebrating Asian American heritage at El Presidio de Santa Barbara State Historic Park. 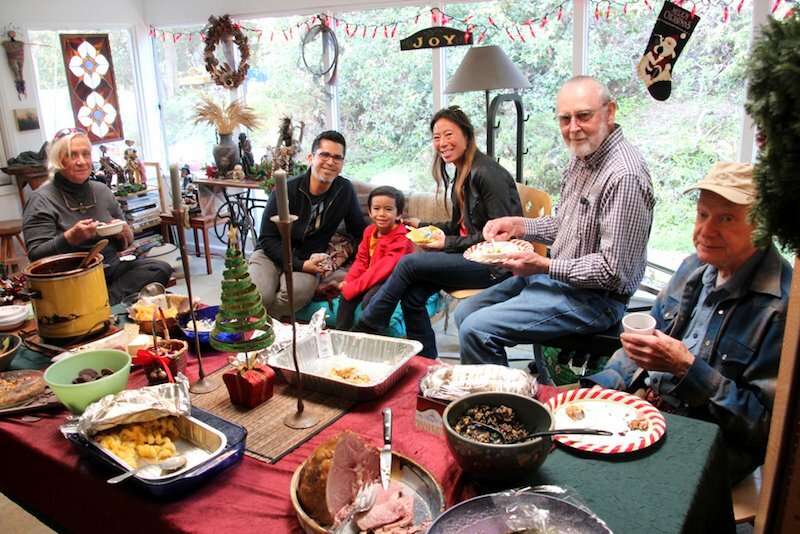 This free, family-friendly event celebrates the history and culture of the Asian communities that once thrived in and around the Santa Barbara Presidio. Learn about a number of Asian cultures through performances, food, and hands-on activities. Performances and artistic displays will celebrate the rich and vibrant traditions of our Asian American community. Traditional cultural performances feature dance, drumming, music, and other performing arts. Free parking in lot at the corner of Santa Barbara and Canon Perdido Streets behind Panino at 834 Santa Barbara Street. Please think about bringing one of your trees for our display. It’s great exposure for our club. We always get a nice response from visitors and we get to hear a lot of enthusiastic drumming. Contact Joe Olson, joeyuccaseed@verizon.net, for more information. 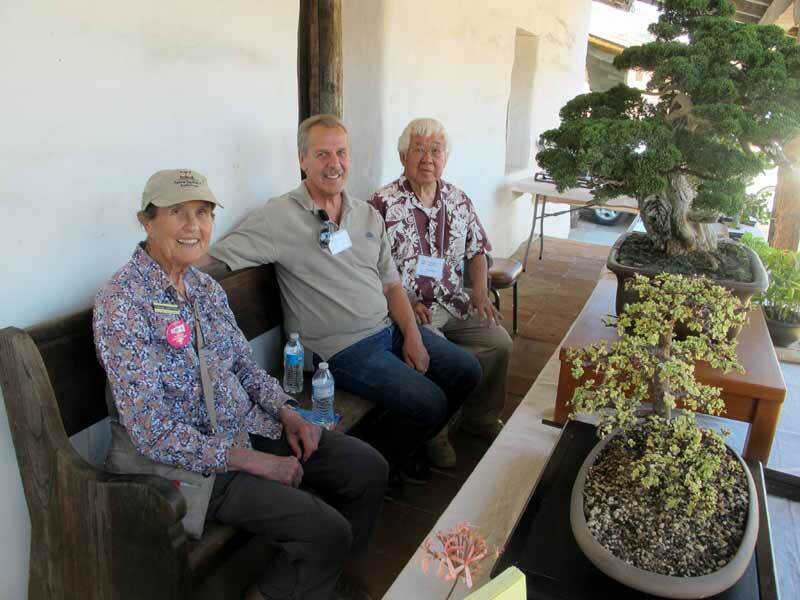 Golden State Bonsai Federation (GSBF): 2017 Convention 40 “Bonsai New Horizon” at the Riverside Convention Center, 3637 Fifth Street near Main. Headliners: Kunio Kobayashi, David Nguy, Boon Manakitivipart. Guest Artists: Ted Matson, Tak Shimazu, and more. Demonstrations, seminars, critiques, work-shops, benefit drawings, vendors, etc. For more information, please visit gsbfconvention.org. I did not receive any submissions for the Member’s Tree section of this month’s newsletter. Apparently, everyone is too busy preparing their trees for the harsh Southern California winter. So, I thought I’d share a couple natural root-over rock trees and one natural tree and rock display from our recent trip to Colorado.